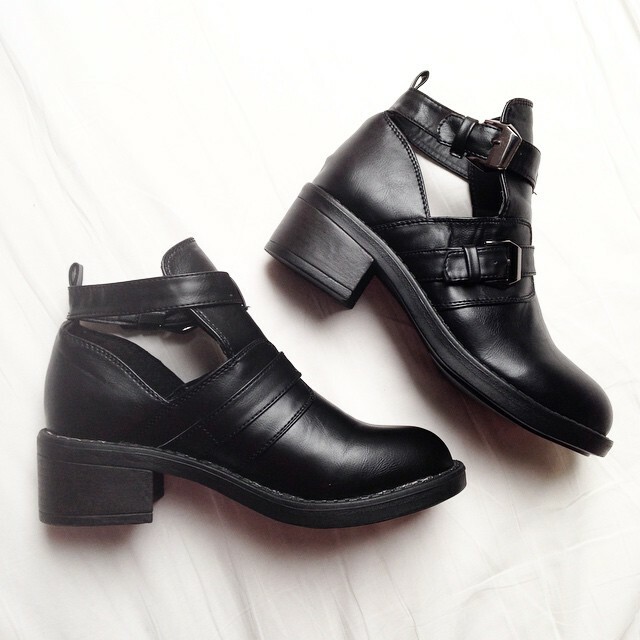 Recently, I was sent some gorgeous Cut-out Chunky Ankle Boots* from Shoezone. I was so excited for them to arrive (I snapped this photo as soon as they were delivered!) as I couldn't wait to style them - I fell in love with their edgy vibe as soon as I saw them on the site! They are quite chunky and the buckles are large which initially I was worried would make my feet look wide and clunky but I was pleasantly surprised. The buckles are adjustable which is useful as I have quite narrow ankles. I decided to style them with a pair of frilly ankle socks from Topshop, black opaque tights and a floral patterned dress from Forever 21. I love the way this looked, giving a girly and feminine outfit an edgier twist! Many people complain about having to wear certain socks with cut-out boots, but personally I'm not going to restrict myself to only wearing black with them. I think it would look great to add a pop of colour to an outfit by wearing bright socks, and Topshop sells some adorable socks with a variety of prints which will also be making an appearance through the little cut-out! I'm looking forward to wearing these boots in the Spring/Summer with dresses, skirts and shorts to add something a little different to my usually quite classic and simple style. I plan to wear them with my Oasis leather biker jacket too as I think they'll compliment each other well! I love these! I bet they're a reasonable price too. I'll have to have a look next time I'm in town. I would have never thought to add those cute little white socks to them. Totally borrowing that idea now.